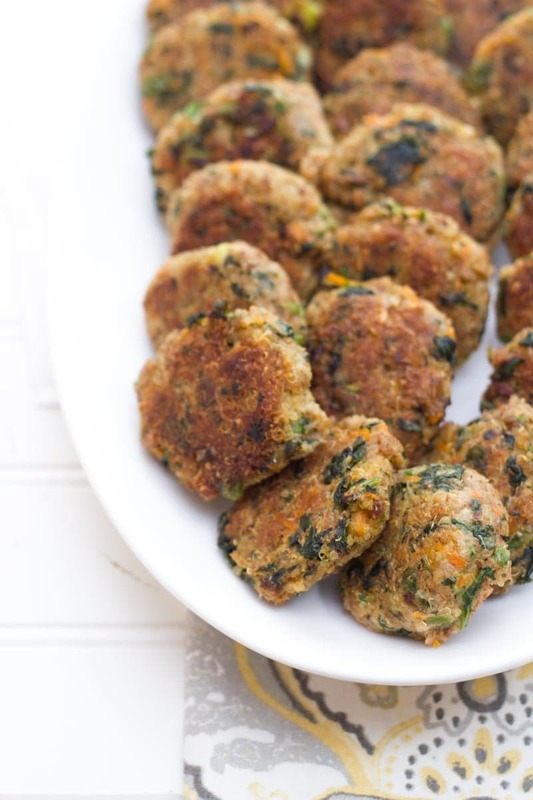 Showcase the power of two vegetarian superfoods in these spinach and quinoa patties. Perfect for snacks, lunches or dinner! There are a lot of things about my life that have changed since I became a parent. I now consistently go to bed while it’s still light out. I do adult things like pay for life insurance. Each room of my house is littered with toys. And my diet has totally changed. I definitely didn’t foresee such a huge shift in what I ate back when I was prepping for parenthood. There are a number of reasons why the change happened. First of all, obviously, my time is limited. And a lot of that limited time is spent holding a baby, which means I no longer have two free hands to cook and eat food with the wild abandon I once had. Secondly, we discovered a few months back that my JuneBug has a milk and soy protein intolerance, meaning I’ve cut out all soy and dairy from my diet. Thankfully, most kids grow out of the intolerance within the first year, and I’ll eventually be able to drown myself in cheese again, but for now, my diet is limited. The two things combined mean my diet is drastically different from what I was eating pre-baby. And let me tell you, this combination isn’t very conducive to healthy eating. More of my diet than I like to admit is made up of granola bars (I have a specific brand and variety that I know is soy- and diary-free) and trail mix. There is absolutely nothing wrong with either, but when they make up a large portion of your daily calorie intake, it’s not a very balanced way of eating. And I’m feeling it. The sugar overload has me feeling completely run down (well, that and having a four-month old). I decided this past week I was sick and tired of feeling sick and tired, and decided to (a) complain about it on the internet for the whole world to see and (b) do something to fix it. So I headed to the kitchen and powered through a bunch of cooking in order to whip myself up some new mom friendly foods. Healthy, fast, not packed with sugar, soy or daiy, and preferably easy to eat with one hand. 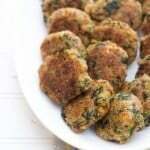 The first of my Mommy munchies are these super tasty quinoa patties. These are like little health food superstars wrapped up in an easy grab-and-go package. They are a source of complete, vegetarian protein (thanks to the quinoa), they are packed with nutrients because of the carrots and spinach. They are both filling and nourishing. And, if you think all of this sounds like a recipe for tastebud boredom, you’ll be happy to know that these patties are incredibly flavorful. I was so impressed with the explosive flavor of these guys. I’ve been eating them straight out of the fridge (see previous note about lack of time), but you can also top them with sour cream, tzatziki, hummus to add a bit more punch. These patties are so versatile! Crumble them onto a salad. Eat them as a side dish for dinner. Form them into bigger patties for a veggie burger substitute. Pack them into a lunch. Freeze them up for later eating. It may seem like this recipe makes a ton, but I promise you’ll find a way to use them—and then wish you’d doubled the recipe. I cooked these up by pan-frying them in a touch of avocado oil (it has a nice high smoke point), which made them crispy and crunchy, but if you want to be mega-healthy, you could also bake them in a medium oven for 15-20 minutes until they are golden brown. Personally, I feel like pan-frying quinoa and spinach is the picture of balance. Life is too short to eat your quinoa baked. Or something like that. 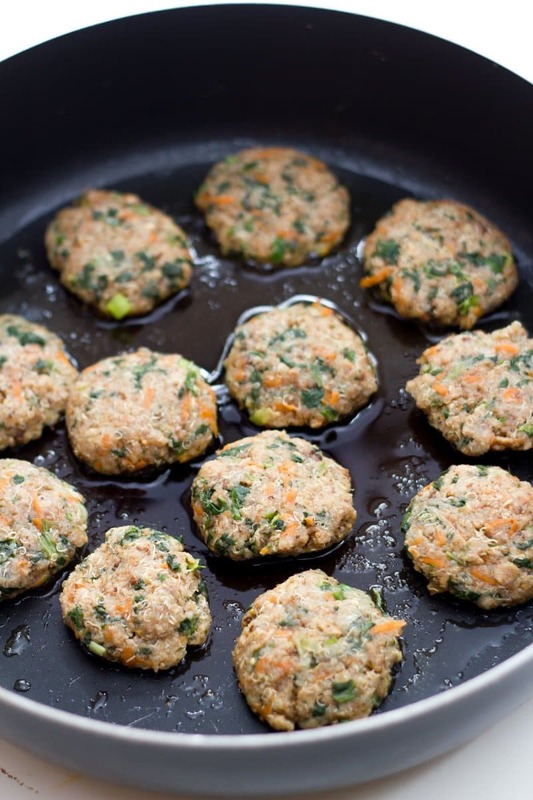 Combine all ingredients, except the oil, in a medium mixing bowl until well mixed, adding in more breadcrumbs if necessary to achieve a mixture that will hold its shape when formed into patties. Let the mixture rest for 5-10 minutes to allow melding. Heat the oil in a large skillet over medium-high heat. Form the mixture into small patties (about 2″ wide) and, working in batches, cook patties in heated skillet for two minutes on one side, flip and cook for an additional two minutes, or until both sides are golden brown. Let quinoa patties cool on paper towels. Poor June-bug! My little Lola-bug is 7 weeks and I’m cutting dairy as well. I don’t think ours is an allergy, but it exacerbatea her reflux and makes her soooo gassy. Combine that with a soy protein allergy (mine) and we’re in the same boat! Cheers to cute babies and cheese in the future. These look great – I know what I’m having for dinner tonight. Thanks So much for sharing. Question: I noticed your quinoa in the bowl pic, looks pretty liquidy still, does that help them form better? I usually cook mine long so there’s no moisture (texture issues). Thanks! 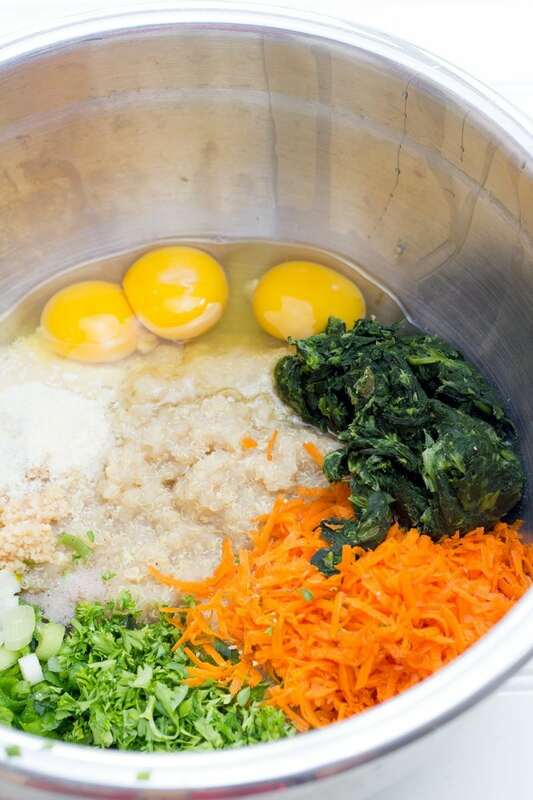 I tend to leave my quinoa a bit liquidy (I like the creamier texture), but if you cook it until it’s dry and fluffy, just cut back on the amount of breadcrumbs you add in—and maybe toss in another egg if things don’t seem to stick. so these are not gluten free. What can be used instead of the wheat bread crumbs? Would Oats work? Yup, ground up, or gluten-free breadcrumbs. My youngest was also MSPI and I also had to cut out wheat and nuts. So I totally feel your pain. It took about 2 1/2 years for him to outgrow it, but thankfully he can tolerate all the proteins well now. I love the looks of this recipe and will definitely be giving it a try! These look really good! Eating once you have children is never the same again, or at least it has not been for me. I never knew I could have so much heart burn and ingestion from quick meals and eating while standing doing other things. I have found the some weekly food prep like cutting a big container of veggies helps though. Plus, once kids are a bit older they enjoy being on your back while you prep food and cook. Once they start walking though… all bets are off again!! I love making quinoa patties.. never made some with spinach before. Definitely need to try out your recipe, thanks for sharing it! This looks like a dish I would love! I just made these yesterday and they are delicious and awesome! I started Yoga Teacher Training and wanted something I could bring to class to quickly eat that was nutritious but still felt like dinner and these are perfect! I used celery instead of carrot, fresh spinach instead of frozen (didn’t have frozen) and added red onion. Also didn’t use the cheese (again, we didn’t have any) and they still taste great. Thanks for the recipe! even though im not a mom, i still struggle with time and these kind of recipes will certainly be helpful. thank you. While I still do have both of my hands at my disposal, being a student who’s away from home most of the time, granola bars have become my diet. I love that you took the time to do something good and nourishing for your mind, body, and soul! I’m new to this blog, and I’m so glad I found you, Cassie! I look forward to following your journey! These look amazing! Love the use of panko for a crunchy outside! These look delicious! Do you think they could be frozen? Does anyone have the nutritional information for these? Thank You! !This is great! Everyone needs to write down this site. This is a great recipe. Even my husband, who doesn’t like food that tastes “healthy”, loves these. I changed a few things though: I substituted the garlic and onions with chives (because I want to take them to work) and added a red bell pepper. Yummy! I found this recipe only 2 weeks ago, and have made them 3 times so far. They are delicious! I didn’t have any spinach on hand so I used swiss chard, and we like spice so I added a little cayenne. Also I used peanut oil, and my husband says they taste like spring rolls. A keeper recipe! I made these tonight and they’re so good! My family loved them!! I added a couple dashes of Worcestershire sauce as well. I’ll definitely be making these again!!!! This recipe was absolutely delicious! It has now become my all time favorite patty. The only thing I altered was fresh spinach (6 cups) and chopped fine in the food processor. These patties are so versatile . You can make them big or small. They can be used in a sandwich or wrap, as a side dish, appetizer or as the main dish.. Enjoy everyone! This recipe sounds so good can’t wait to try it. I wanted to ask about to to store it? 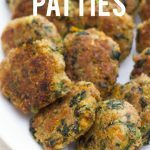 I was planning on making them for a gathering so can I make the raw mixture ahead of time and form them into patties and refrigerate it till my guest arrive and then fry them in the pan? Or leaving the mixture in the fridge overnight? Thanks!! These look so delicious, can’t wait to try them. Question, can you leave out the breadcrumbs entirely if you cook the quinoa for longer and maybe add another egg? Hmmm, I’m not sure about leaving out the breadcrumbs. Quinoa just doesn’t hold together super well on its own (even if it is cooked drier). It’s worth a shot though! Have you heard if these were made successfully without the breadcrumbs? :-/ I want to make them without because i am allergic, but don’t want it to be a fail :-/ Thanks!!! Hi! I was wondering if you tried making these without the breadcrumbs? that’s what I was planning on doing since I am allergic them them, but her comment made me think differently…. can I make the breadcrumbs myself? How coarse do you recommend I make them then? Sure, just toast some bread, and then blend them in a food processor or blender until a little smaller than the size of a pea. There is no broccoli in this recipe (or in the photos). Maybe you are mistaking the frozen spinach for broccoli? Can the mixture be put in a greased/buttered dish and baked for say 15 minutes? I’ve never tried it, but I think it could work. I would recommend elevating them on a baking rack in a dish, and then spraying them with cooking spray and baking them at a highish temp (around 400°). Let me know how it works! im new in these stuff may i replace quinoa with chia seeds? 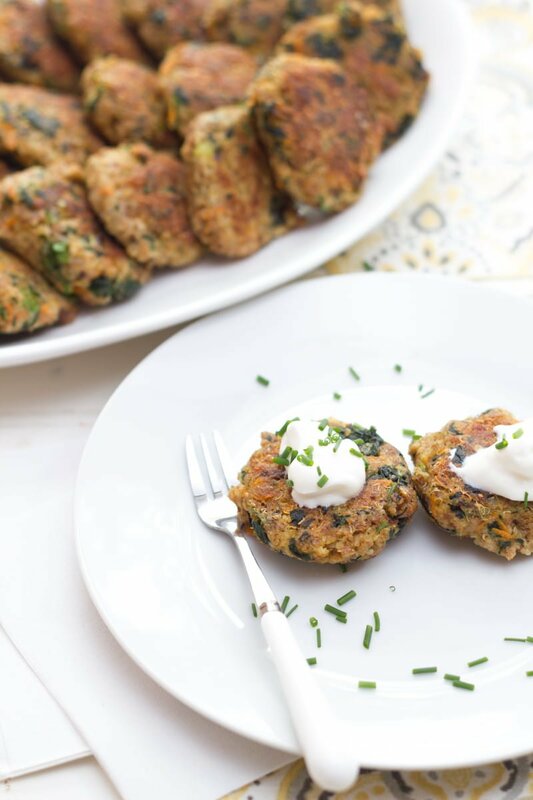 I just made these for our Sunday dinner, and wow were they delicious! I chopped the carrots instead because I like the texture and made them more “burger sized”, and they had wonderful flavor and texture. They are very versatile and so easy! Definitely a keeper recipe! Could I substitute the eggs with flax meal for a vegan version? Thank you….I will try it! I liked these a lot. My only issue is that my hands ended up coated with the mix and at the end I scraped what was on my hands and made a small patty! Any recommendations to make the process less messy? Try wetting your hands first, or rubbing a little oil on your hands before you form the patties! Thank you for this recipe, I can’t believe how many this made! They are going in a freezer bag to keep at work for a healthy meal, no rushed poor nutrition meals now! And there are so many ways to mix up the spices/veggies in these to keep it from getting boring, sautéed mushrooms, peppers, even black beans, so excited to find this recipe!! Having these on hand for quick meals is the best! Made these last week and loved them! I froze the leftovers and have been heating them up and having them for snacks. I did bake them on parchment paper instead of frying as I am trying to cut calories. Any idea on a calorie count? I want to use them as appetizers for a dinner party. Can i make them ahead of time and heat them in the oven at 350 for sometime before serving? Are they going to be crispy? Are they going to dry out? Hmm, I’m not sure. I do know they freeze really well, so you could make them ahead of time and freeze them until party time! I made these again today only this time I used grated zucchini (fresh from the garden) instead of spinach – very tasty!! I also baked them instead of frying because I could get more on the pan. These are so good! I just made these for my daughter’s lunch. She is a 13 year old athletic vegetarian. I’m always looking for ways to get her protein. I’ve never tested them with a chia or a flax egg (or egg replacer), but it might just work! Let me know if you try it out.